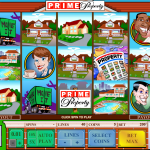 Prime Property is a video slot game coming from Microgaming software. The game takes you on a hunt for the perfect house. Whether you like a small cabin in the wild or a luxurious house with a private pool, you will definitely find one that suits your needs. Prime Property is a very colorful game and judging from the symbols we can say that the real estate’s were the main inspiration for this slot. If you are one of those people that enjoy talking about prices, rent or interest rates than this is the perfect game for you. 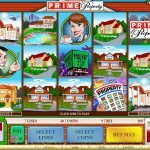 The Property newspaper, removal truck Scatter and Prime Property sign Wild are 3 bonus symbols in this game that can really make a change when it comes to your bankroll. Once you start playing the game you will notice that the scatter symbol is not the one that triggers the bonus round in this slot. 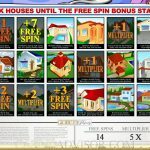 The Property symbol is the key to the free spins where you will receive 1 free spin with x 1 multiplier for 3 symbols, 2 free spins with x 2 multiplier for 4 symbols and 3 free spins with x 3 multiplier for 5 symbols. This is the initial prize and you can win even more free spins and multipliers by picking houses. The wild symbol, not only does it come with a fun animation, but it also substitutes for all the other symbols except for the scatter and the bonus sign. The scatter symbol in this game offers scatter payouts only. Prime Property is a game that definitely deserves the attention it is receiving at this point and we are not surprised since this game comes from Microgaming. The unique and amusing theme will keep you entertained for a long time. If you are lucky enough you might really end up with a dream house of your own. If you love the winter and Christmas then you should consider playing Santa’s Wild Ride a 5 reel slot by MicroGaming.